It’s well past time for accountability in the child safety system. Governor Ducey and his hand-picked director of the Department of Child Safety, Greg McKay, continue to fail too many of our community’s most vulnerable children. More than 13,000 cases remain in a backlog that daily risks the lives and well-being of children all over Arizona. This issue desperately needs leadership, and this year, Legislative Democrats proposed a series of reforms to help build better communities and help kids stay safe and families stay whole. The proposed reforms would all prioritize child safety: that is, after all, the department’s mandate. Democrats proposed raising the required qualifications for the DCS director to ensure he or she would, in the future, have the skills and experience to protect Arizona’s vulnerable children. Other proposals include implementing independent recommendations that already exist and moderately increasing wages for caseworkers to reduce their staggering turnover rate. Last year, McKay told the Child Safety Oversight Committee that many employees are overwhelmed by the sheer volume of their caseloads. He shared that an employee confided that many of the staff have boxes under their desks of “abandoned cases that came from the last people that quit,” and that there is pervasive concern that a child in one of the cases in those boxes could die. Partisanship has prevented many of these Democratic reforms from receiving consideration. Some people at the Capitol prioritize ideology above the safety of Arizona children—even when the number of children being removed from their homes is so high, at 37 percent, that there are not enough places for them to sleep. The Arizona Republic recently reported more children will have to sleep in state offices. Additionally, Democrats have championed bills that would increase childcare resources for working families. We also proposed restoring TANF benefits to 24 months because, for many Arizona families and children, TANF makes the difference between eating and not eating. The $4 million cost is a small price to pay to keep children all over the state from going to bed hungry, but the governor could not find room for it in his budget proposal, and legislative Republicans have given no indication that they will either. These policies would improve accountability, invest in families and help make our communities stronger. 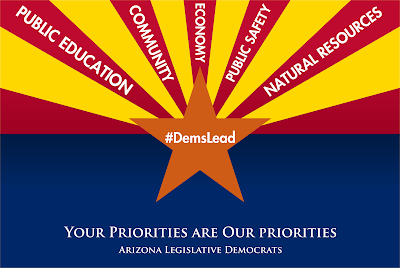 Democrats have a plan to move Arizona forward that includes correcting the DCS crisis and protecting kids. To see a summary of this plan, click here.